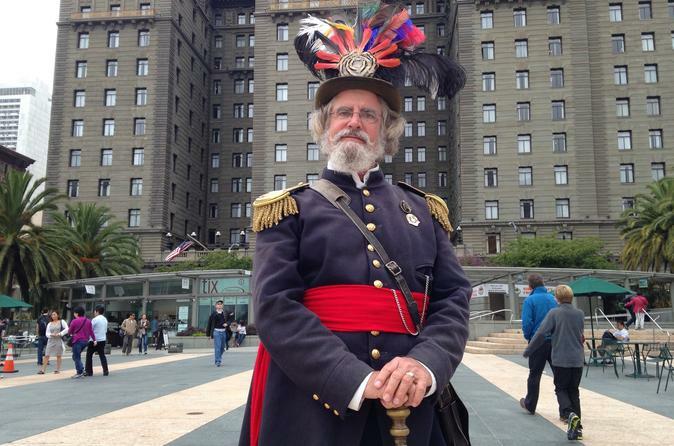 Be informed and entertained on this one-of-a-kind 3-hour walking tour of downtown San Francisco, led by an impersonator of the late Emperor Norton. Self-proclaimed as the Emperor of the US, this 19th-century character comes to life as your guide leads you back to the past. Step into a time machine of sorts and learn about the Barbary Coast, the 1906 earthquake, and historic landmarks surrounding Union Square. Meet your guide in Union Square and set off on a 2.75-hour walking tour of downtown San Francisco. Prepare for the unexpected with your guide, whose specialty is appearing as the late Emperor Norton in feathered hat and full regalia. Learn about this colorful character of mythic proportions, who also named himself Protector of Mexico, and travel back in time to the former Barbary Coast. Stroll about 2 miles (3.2 km) to historic landmarks while your guide regales you with fascinating anecdotes, including about the devastation from the 1906 earthquake and fire. Hear the story of two beloved stray dogs, Bummer and Lazarus, that roamed the city in the 1860s. Stops on your itinerary include the St. Francis Hotel, Maiden Lane, Lotta's Fountain, the Palace Hotel, Jackson Square, Portsmouth Square, and more.